The Tax Cuts and Jobs Act is mostly good news for retirees. The Tax Cuts and Jobs Act when signed into law will mean tax cuts for most Americans. Nevertheless, change—even good change—can bring about uncertainty. Retirees may be the most concerned about what the new tax legislation will mean for them, as most rely on relatively fixed incomes. But in fact, the Tax Cuts and Jobs Act is mostly good news for retirees. For the most part, they will be less affected than other Americans, as the changes do not affect the way Social Security and investment income are taxed. Many retirees will in fact benefit from the tax bill’s doubling the size of the standard deduction. While seniors’ earnings and pension income will be subject to new individual income tax brackets and rates, those changes will mean tax cuts—not increases—for an overwhelming majority of seniors and retirees. There are three provisions in the new tax law that could particularly affect retirees. Currently, anyone who has high medical expenses can deduct the portion of those expenses that exceeds 10 percent of their income. So a couple who earns $40,000 in income and has $10,000 in medical expenses can deduct $6,000 of those expenses. The Tax Cuts and Jobs Act increases the deductible amount to over 7.5 percent of income for 2017 and 2018. In the above example, this would mean a $7,000 deduction. 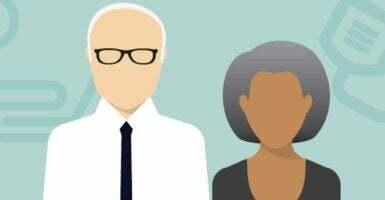 Currently, in addition to claiming a $4,050 personal exemption, people over 65 can also claim a $1,250 blind or elderly deduction. The Tax Cuts and Jobs Act maintains the blind and elderly deduction but eliminates the personal exemption and replaces it with a roughly doubled standard deduction. Two of the deductions that have received the most attention are changes to state and local taxes and mortgage interest. The new tax legislation caps state and local tax deductions at $10,000. For mortgage interest, the final legislation caps the mortgage interest deduction at $750,000, but only for new home purchases. These deductions tend to have less impact on retirees who often have no mortgage or are far enough along in their mortgage payments that they have little mortgage interest. Retirees typically also have lower state and local income taxes because not all of their income is subject to taxation. To illustrate just how the Tax Cuts and Jobs Act will affect different retirees, consider these five examples. Evelyn is a retired waitress and a widow. 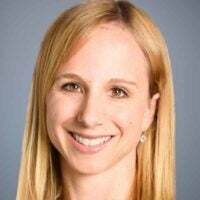 She receives an average-level Social Security benefit of $16,000 per year, as well as $11,000 from her husband’s 401(k). She has $10,000 in medical expenses. Evelyn’s tax bill will not change under the final legislation. She does not pay anything under the current tax system, and she won’t pay anything under the new system because it does not change the taxation of Social Security benefits or investment income. 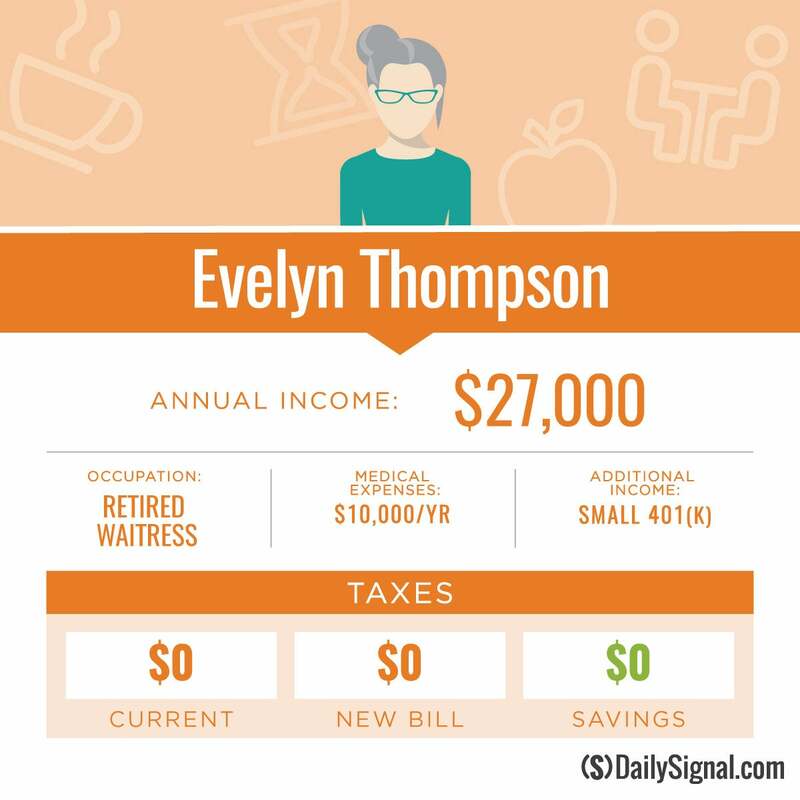 Moreover, the increased standard deduction means that if Evelyn were to receive or earn more income, more of it would not be taxable. Phillip is a retired utility worker. He earned an average income throughout his career, but now receives a significant pension and even saved a little on his own through a 401(k). His combined retirement income is $50,000 a year, consisting of $18,000 in Social Security benefits, a $28,000 pension, and $4,000 in 401(k) income. 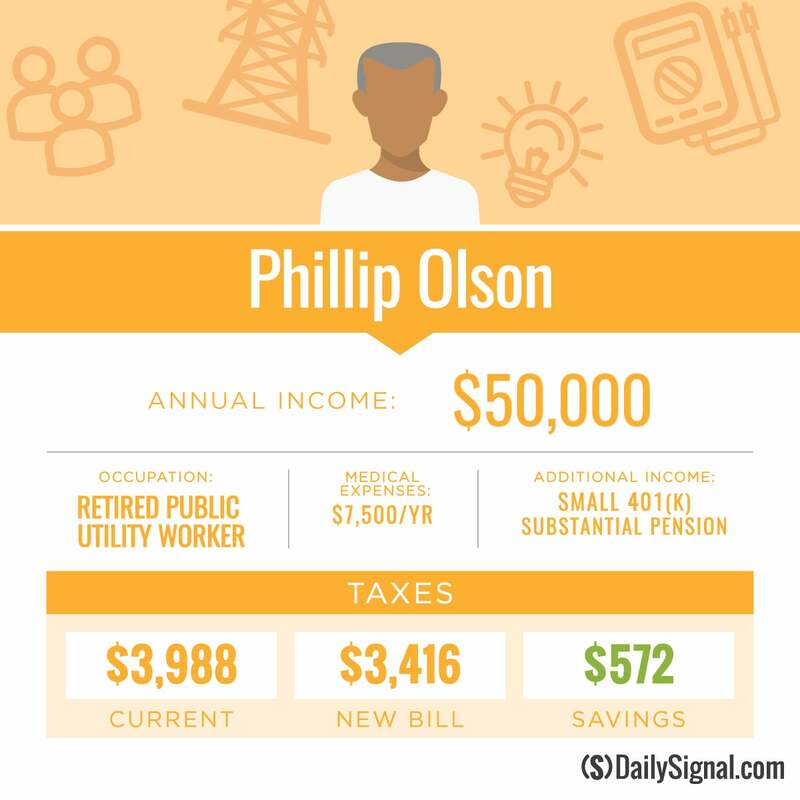 Phil has $7,500 in medical expenses, and he currently pays $3,988 in federal taxes. Phil’s tax bill will go down by $572, or 14.4 percent, under the final tax reform legislation (to $3,416). Phil’s tax cut is primarily the result of lower marginal tax rates on his $28,000 in pension income. In addition, no changes will be made to the taxation of Phil’s $18,000 in Social Security benefits, or his $4,000 in 401(k) income. Although Phil has $7,500 in medical expenses, the higher standard deduction makes it not worthwhile for him to deduct these expenses, meaning he will face less paperwork and a simpler tax-filing process. 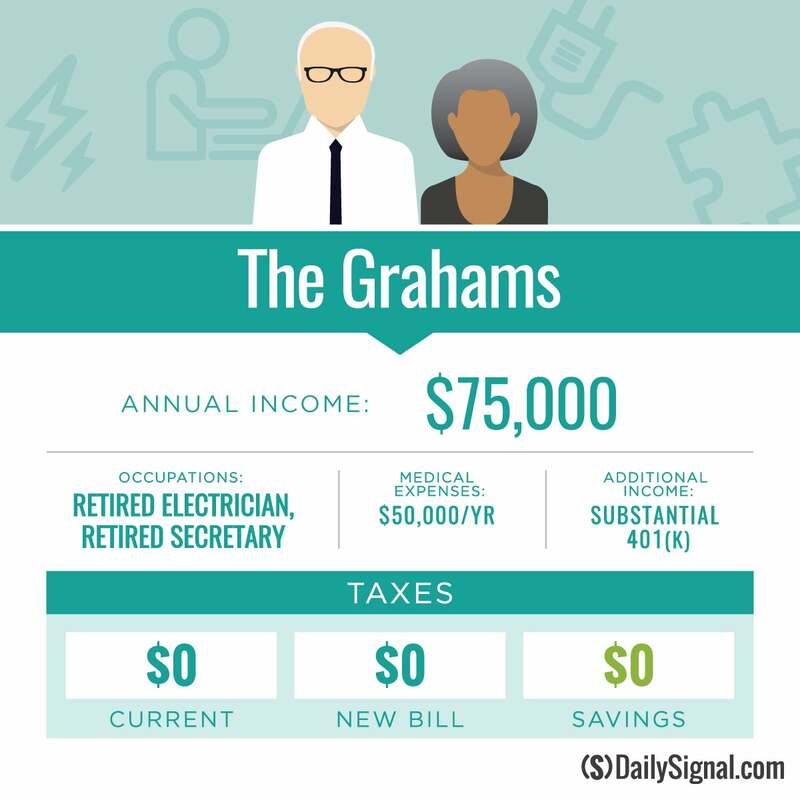 The Grahams are a middle-income retired couple with very high medical expenses. Craig was an electrician and Grace was a secretary. Together, they receive $25,000 a year from Social Security and $50,000 from their 401(k) savings, making for a total income of $75,000. However, Craig’s health has deteriorated significantly and he had to enter a nursing home this year, which resulted in $50,000 in out-of-pocket medical costs. Because all of their income comes from Social Security and investments—which the new tax legislation does not change—the Grahams’ tax bill will not change under the new Tax Cuts and Jobs Act. In each case, they owe nothing in federal income taxes. Since the Grahams already owe no federal income taxes, they do not benefit from the new tax reform bill’s temporary increase (for 2017 and 2018) in the medical expenses deduction—from the current law’s amount exceeding 10 percent of income to the new legislation’s amount exceeding 7.5 percent of income. 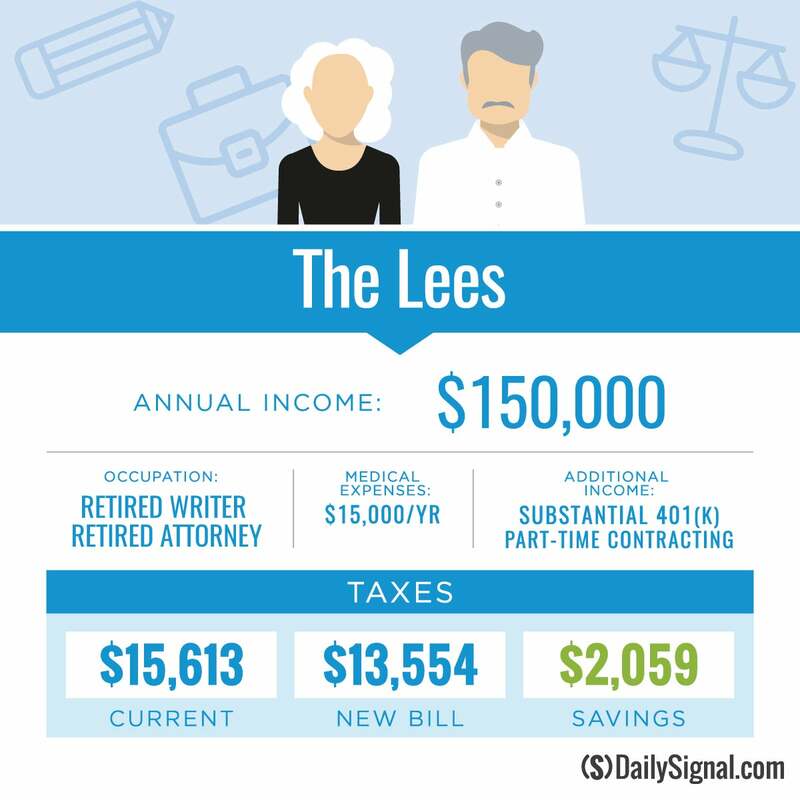 The Lees are a semi-retired, upper-income couple. Michael was a writer and Sarah was an attorney, but both still do some contract work on the side. The Lees have a combined income of $150,000 a year, consisting of $50,000 in earnings, $50,000 in Social Security benefits, and $50,000 in investment income from their 401(k)s. They have $15,000 in out-of-pocket medical expenses, and currently pay $15,613 in federal income taxes. Under the new tax rates and rules, they will pay $2,059, or 13.2 percent less (their federal income tax bill would be $13,554). The Lees’ taxable income declines slightly due to the higher allowance for medical expense deductions, but the main source of their tax cut is the tax legislation’s lower tax rates on their earned income. The Garcias are a wealthy retired couple. At one time, they jointly operated their own real estate development company, which they have since passed on to their children. 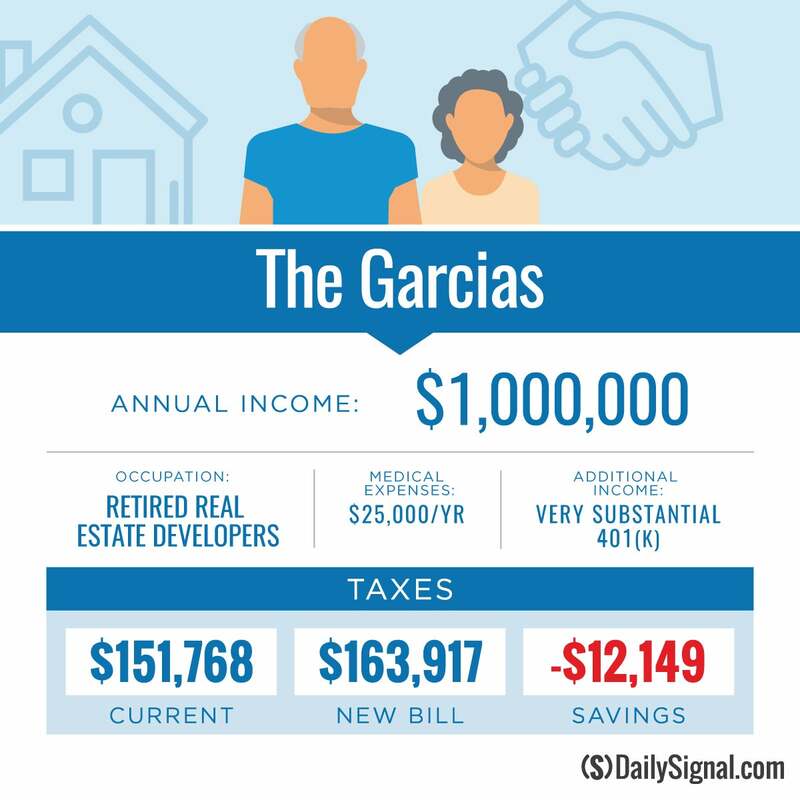 The Garcias have accumulated significant savings, and they receive $950,000 in investment income each year along with $50,000 in Social Security benefits. The Garcias make generous charitable donations of $100,000 a year, they have $25,000 in medical expenses, and they pay about $79,000 in state and local taxes. Although the Garcias do not need all of their income to cover their own expenses, they enjoy using their wealth to help their children with their business ventures, to support some family members who live outside the U.S., and to contribute to each of their 10 grandchildren’s college accounts. Under the current tax system, the Garcias pay $151,768 in federal income taxes. Under the new tax system, their taxes will increase by $12,149, or 8 percent (to $163,917). This increase comes from a loss of all but $10,000 of their state and local tax deductions. While the Garcias would lose these deductions, they would keep the full value of other deductions—such as for charitable donations and mortgage interest. That is because the Tax Cuts and Jobs Act eliminates the phase-out of itemized deductions that currently takes some (up to 80 percent) of their deductions. Understandably, many retirees may be concerned about how the new Tax Cuts and Jobs Act will affect them. But the bare facts of this new legislation should be reassuring: Tax reform, for the vast majority of American seniors, is great news. Moreover, although not represented in seniors’ individual income tax bills, the corporate and small business tax provisions contained in the new tax legislation will benefit seniors both through their investment incomes and their purchases. That’s because the benefits of lower corporate taxes flow to individuals who own stock in those corporations, workers who are employed by those corporations, and consumers who purchase goods and services from those corporations. Once the Tax Cuts and Jobs Act has been signed into law, nearly all American seniors will be able to see that this bill is a win for them.